The Red Lake Nation and the city of Minneapolis are rushing to build emergency shelter for around 200 people living at the state's largest homeless encampment. The new shelter, a so-called "navigation center," has never been built before in Minnesota. The site for the future navigation center was offered by the Red Lake Nation. It's about an acre of asphalt and concrete, just across the eight-lane Hiawatha Avenue from more than 150 tents pitched along a concrete sound barrier. 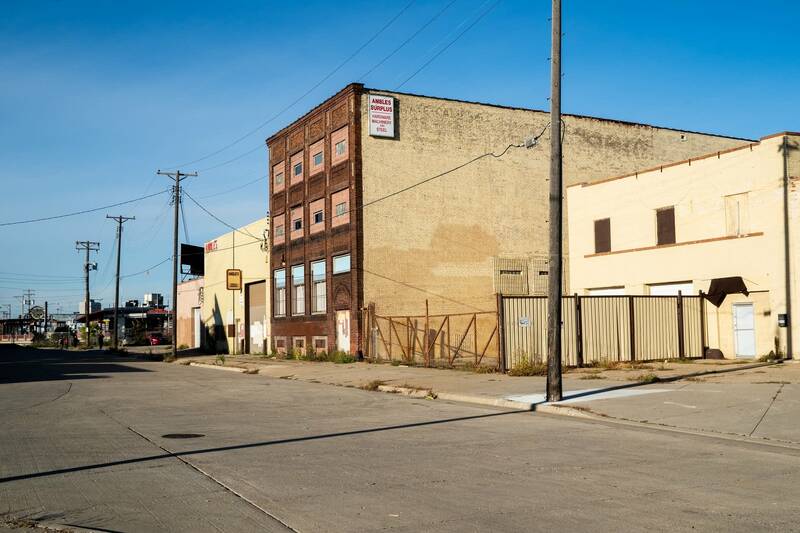 Red Lake tribal Secretary Sam Strong said that within a week they'll tear down vacant industrial buildings where Amble's Machinery Hardware and Steel used to be. In their place, the city of Minneapolis is looking at putting in three massive FEMA-style trailers at an estimated cost of about $1.5 million. Drawings of the plan show there will be hardly any privacy or personal space — each trailer will have more than 50 beds each — but they'll be safer and warmer than tents. "The key thing here is access to all the services which will get them into housing, as well as provide the basic staples of life, food, shelter, clothing, showers. The basic necessities that you would want any of your family to live with," Strong said. Strong doesn't have any particular expertise in building shelters or serving homeless people. He has a degree in urban planning from Cornell. He doesn't even live in Minneapolis, although he was born there. He lives on the Red Lake Reservation in northern Minnesota. But Strong has emerged as one of the key leaders responding to the encampment because the majority of people staying there are Native American — they call it the Wall of Forgotten Natives. Strong says the way the current system works has failed them. "The shelter system is working for some. It is not working for everyone," said Jennifer DeCubellis, Hennepin County's deputy administrator for Health and Human Services. The county operates approximately 1,000 shelter beds and they guarantee families with children shelter, even if they need to pay for a hotel room. But some avoid shelters because they have strict operating hours or they worry about safely storing belongings. "We have found many families in the encampment that have extended family members, that they are not willing to leave in order to enter into shelter with the kids," DeCubellis said. She said the county makes exceptions to its policies, such as letting extended families from the encampment stay together in family shelters. 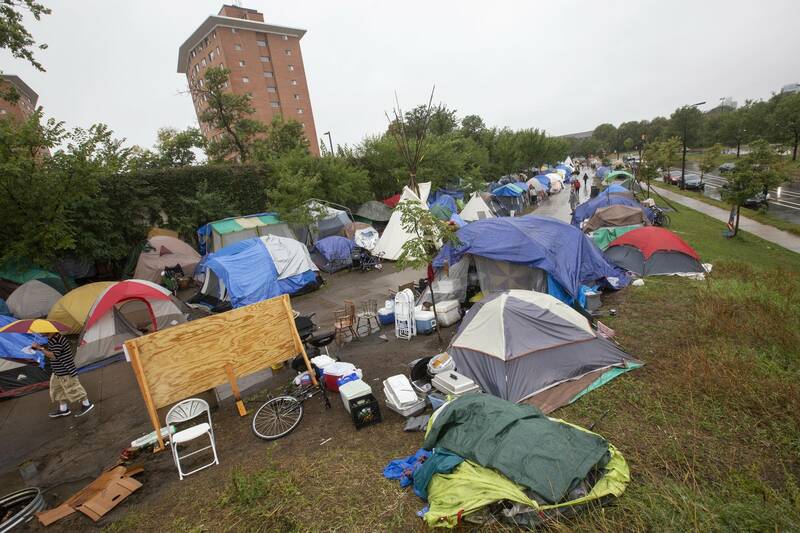 "On average, it's about six to seven families we've been able to move out of the encampment in any given week, and what we find in the next week is six to seven more are there," DeCubellis said. The encampment is home to seniors and children as well as active drug users. The navigation center would be open to all of them, although DeCubellis hopes families will accept alternatives from the county. In the meantime, the city of Minneapolis is trying to fill in the details of how the center will be managed. Navigation centers like the one planned for the Red Lake-owned site have been popping up across the country in cities that also have housing shortages. Still, Nuria Rivera-Vandermyde, city coordinator for Minneapolis, said there's not a ready-made blueprint for the navigation center they're trying to build. "I don't want to knock what other places have done other than we are facing here a Native American community predominantly, and so we want to make sure there's a component of cultural healing and cultural sensitivity to what needs to move forward," she said. Last Thursday, Rivera-Vandermyde told a City Council committee that staff recommend the Adult Shelter Collaborative operate the navigation center. That group is comprised of several nonprofits that serve homeless people including Catholic Charities, St. Stephen's, and the Salvation Army. The whole City Council still needs to review and approve that recommendation. She also said an anonymous donor has come forward with a significant amount of money to fund the navigation center's operations. Native Americans are particularly vulnerable to homelessness. In Minnesota, Native Americans are homeless at a rate 17 times greater than that of white Minnesotans. Along measures of income, education, and health, Native Americans in Minnesota as well as across the country are worse off than any other group. 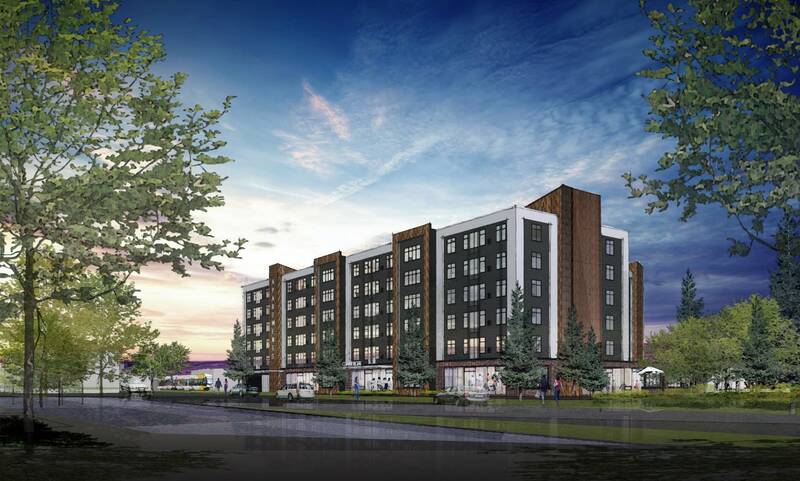 Red Lake plans to build 109 units of affordable housing just south of the Franklin Avenue light rail station in Minneapolis. The project is called Mino-Bimaadiziwin, pictured in this rendering, which means "the good life" in Ojibwe. Courtesy of Cunninghan Group Architecture Inc.
"There's such a need for affordable housing for our members. Here in the city, there's a need for thousands of units of affordable housing. A need for access to health care services. For culturally relevant chemical dependency work. For culturally relevant mental health services. Teaching or reteaching our people our way of life. The strength of our culture, our language. The strength of who we are and our identity," Strong said. Strong is raising money for insulated tents and sleeping bags for people at the encampment site while the navigation center is being built. Officials hope to open the center in December. But he also has a larger vision for meeting the needs of homeless Native Americans. 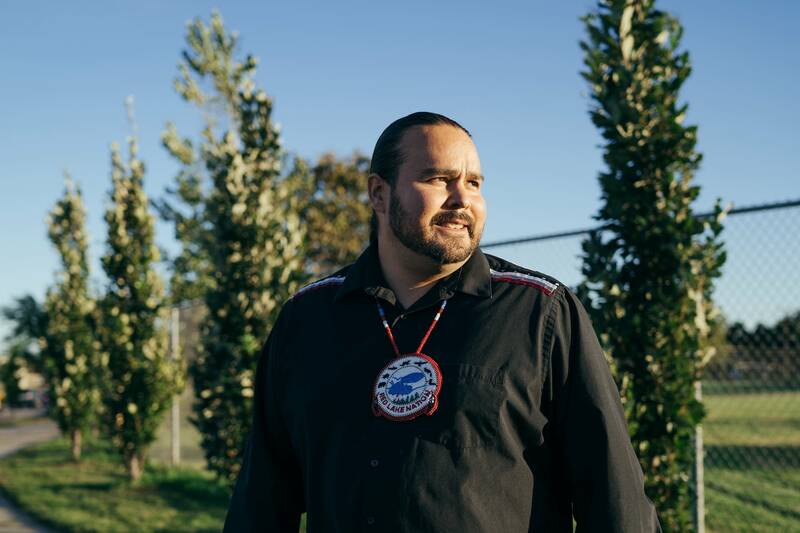 In June, he plans to break ground on an apartment building aimed at low-income Native Americans. It will have space for health care services and a Red Lake Embassy. It'll be called Mino-Bimaadiziwin. In Ojibwe, it means "the good life."